More than 140,000 anxious A-level students are chasing just 10,000 unfilled places at the UK's universities. More than half the 22,000 places available through clearing - the system of allocating unfilled courses - had been filled by Monday lunchtime. This meant places were being filled at more than twice the rate of last year. There is a shortage of university places this year due to a surge in applications and a cap on places. Many universities had no spare places at all and were forced to turn away very good candidates. Some are reported to have rejected students with a string of A grades. Among the UK's Russell Group universities, Cambridge, Oxford, Imperial College London, Bristol and University College London either did not enter clearing, or have had no places available. Nottingham, which usually has around 250 clearing places, has had around 100 this year. Southampton had 25 vacancies. Birmingham had fewer than 50 clearing places, and all are now gone. Gloucestershire University has closed its clearing operation. It only had about 20 full-time places available. University admissions service Ucas said hits to its website were 50% up on last year after A-level results came out. Students use clearing to apply for alternative courses or universities if they fail to get the grades they need to secure their first choices, if they have chosen not to take up an existing offer, or were not holding an offer. 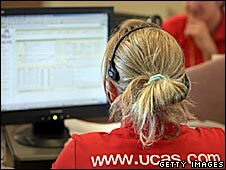 Ucas said there had been more than 1.7m searches for courses on its clearing website. Calls to its helpline were close to 15,000 by the end of the first day. A record 611,947 people have applied to UK universities this year - a more than 10% rise on last year. Some 22,000 places are available through clearing this year, compared to the 43,890 places that were allocated through the process last year. The increase in pressure is thought to be due to a bulge in the population (there are more 18-year-olds this year), the drive to get more young people into higher education and the effects of the recession in encouraging both young and old to go to university. But later offered funding for 13,000 more places as numbers of applicants surged. However, not all universities took up this offer because places were not fully funded. The rising pass rate at A-level has also, over a longer term, made more young people eligible for university. This year the overall pass rate for A-levels in England, Wales and Northern Ireland rose to the record level of 97.5%, adding to the clamour for places. Students in Scotland, who received the results of their Highers earlier this month, had a head start on clearing. The pass rate for Highers also rose - by 0.8 percentage point to 74.2%. There are fears that it will be state school pupils who lose out in the scramble for university places - and teenagers from disadvantaged homes - whom the government have been trying to encourage to go into higher education. A breakdown of results by school type showed that half of the A-levels awarded to candidates from independent schools were at grade A. This compared with about 40% of entries from selective state schools and about 22% of those from comprehensives. Wes Streeting, President of the National Union of Students, said: "I have a real fear that when numbers are published later, the number of pupils from state schools will have fallen." Conservative education spokesman, Michael Gove, said: "The fortunate few are pulling ever further away from the rest and this phenomenon appears to be gathering pace rather than slowing down." Schools Minister Iain Wright said the government had widened the pool of students doing A-levels and going to university, which was no longer the preserve of the privileged few. "The fact is that between 2002 and 2009 the number of A grades increased 44% in the independent sector, whilst over the same period there was a 60% increase in the maintained sector. This suggests the maintained sector is making real gains." What if you don't make the grade? Got your exam results: now what? Is taking an A-level easier 20 years on?